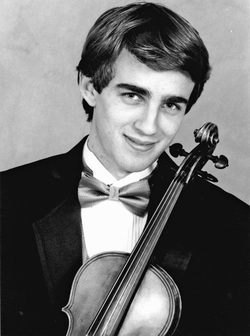 A native of Los Angeles, violinist Timothy Braun made his debut with symphony orchestra at age nine and since then has been engaged by many of California’s leading orchestras including the Westchester, Brentwood, Redlands, Peninsula, Asia America Symphonies, the Pacific Philharmonic, and the Chamber Orchestra of the South Bay. His 2006-2007 season includes solo engagements with the Burbank Philharmonic, the Rio Hondo Symphony and the YMF Debut Orchestra among others. He has performed at the Niagara International Music Festival, Canada, the Pan Pacific Music Festival, Australia and the Casalmaggiore Music Festival, Italy, and through the auspices of the Young Musicians Foundation he has performed in such American venues as the Ravinia Festival, Lincoln Center, Avery Fisher Hall, Walt Disney Concert Hall and the Hollywood Bowl. Timothy Braun has collaborated with violinists Jamie Laredo, and Mark O’Connor and has performed on NPR, KUSC and KMZT radio, the Jerry Lewis MDA Telethon, and Crystal Cathedral International telebroadcast. He currently studies under Jascha Heifetz Distinguished Chair pedagogue, Robert Lipsett, at The Colburn School, in Los Angeles, where he was one of five accepted in 2003 to pursue the Bachelor of Music Performance degree. This past summer he studied at The International Holland Music Sessions, in Amsterdam and at the Itzhak Perlman Chamber Music Institute in New York.